Sitting next to me on the desk is a stack of three slim volumes, each containing about 50 pages of research and argument. 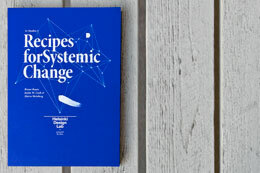 These books are called challenge briefings and they're the first step in organizing a strategic design studio. The first batch of Challenge Briefings are back from the printer! This is also a sneak peak into the new look of HDL. More when the new site launches. A strategic design studio! HDL is hosting three studios this summer, each one looking at a systemic problem here in Finland. Since our new website is still forthcoming, here's a little peak into what the HDL Studios are all about. 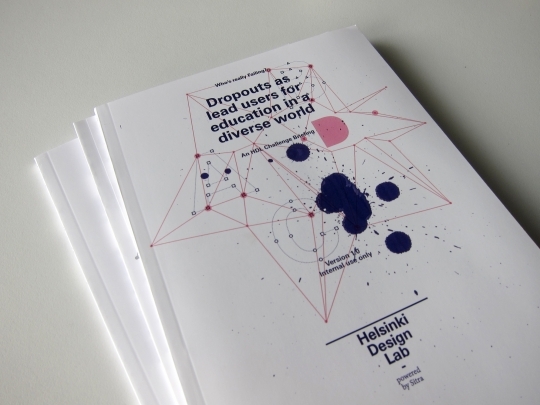 The first studio will look at the broad theme of education with a specific focus on the "lost boys" of Finland, dropouts who disappear from the system completely. Our second studio is an extension of the intellectual capital devleoped by the Low2No competition and will concentrate on a national sustainability strategy with a focus on carbon neutrality in the built environment. Finally, the third studio is focusing on the challenges of an ageing society and how this impacts welfare and the welfare system. For each of these studios we've built a small, top-notch team of eight experts with demonstrated leadership in their respective fields and a commitment to open and collaborative work. These teams will come together to spend a week with us in Helsinki and charrette on the topic. They are free to choose an appropriate medium, but each studio has been asked to develop a roadmap to strategic improvement and identify a "top ten" list of possible interventions. Given the understanding of the problem that will be collectively developing, what can be done to deliver significant improvement? But back to those Briefings. They're following on the competition brief developed for Low2No and will be familiar to anyone who has seen a design brief before – only they're focusing on the opportunities for the redesign of systems rather than objects. Once we've seen how the studios make use of them we will revise the briefing documents and make them available on this website. This should happen later in the summer, so please bear with us. With this one small but significant part of the puzzle completed, I'd like to thank Adriel Mesznik and Ezra block who took the lead on developing content for the Ageing and Education briefings respectively. Thanks, guys! This was week 56: a short and blurry week. Three publications done and printed, one publication ramping up, a website that's almost done, and lots of other little bits keeping us busy. FREE BOOK Including an introduction to strategic design, a how-to manual for the HDL Studio Model, and practical examples.